The DigiLit Leicester project is a two year collaboration between Leicester City Council, De Montfort University and 23 secondary and SEN schools. Leicester’s secondary schools collectively support approximately 20,270 learners each year, the majority of which are between 11 and 16 years old. The project focuses on supporting secondary school teaching and teaching support staff in developing their digital literacy knowledge, skills and practice, and their effective use of digital tools, environments and approaches in their work with learners. In consultation with participating schools, a Digital Literacy Framework was developed, linking digital literacy with secondary school practice. An online survey was developed, linked to the framework, designed to support staff in reflecting on their use of technology to support teaching and learning, and to provide individual staff members, schools and the Council with information to inform future planning around professional development. Fifty six per cent of staff across the city who participated in the survey classified their skills and confidence at the highest level – Pioneer – in one or more of the six key digital literacy areas. Twenty three per cent of all those who participated in the survey placed themselves at Entry level in one or more of the six key areas. Staff rate their skills and confidence highest in the area of E-Safety and Online Identity, with 43.5 per cent of respondents scoring at Pioneer level. Staff feel least confident in the area of Communication, Collaboration and Participation, with 9 per cent of staff rating themselves as Entry level and 38.7 per cent falling within the lower levels of the framework (at either Entry or Core level). In Creating and Sharing , 42.1 per cent of staff rated their skills and confidence in the lower levels of the framework (Entry and Core levels). Analysis comparing the survey data from 2013 and 2014 shows that a statistically significant change in staff confidence has occurred, with 21 per cent of participants noting an increase in their skills and confidence. Levels achieved increased in five of the six key areas (excluding E-Safety and Online Identity where levels were already high). 1. Ensure that the work being done by city Pioneers is promoted and shared more widely. Promote and support the use of open licences to enable wider discovery, use and reuse of educational resources produced by city staff. 2. Provide encouragement, opportunity and recognition to Pioneers who support Entry level colleagues. 3. Provide supported opportunities and resources specifically designed for and accessible to Entry level staff, particularly in relation to Assessment and Feedback andCommunication, Collaboration and Participation. 4. Continue to provide support for self-directed staff development projects and activities. This approach is supported by the research literature, which has shown that professional development programmes that support staff in focusing on developing their own knowledge ‘are most likely to lead to transformative change’ (Fraser et al. 2007, p.167). 5. Continue to support work which supports schools in expanding the safe and effective use of social and collaborative technologies. 6. Complete work on the project’s current Open Education schools project, and evaluate the benefit of continued focus on and additional work in this area. 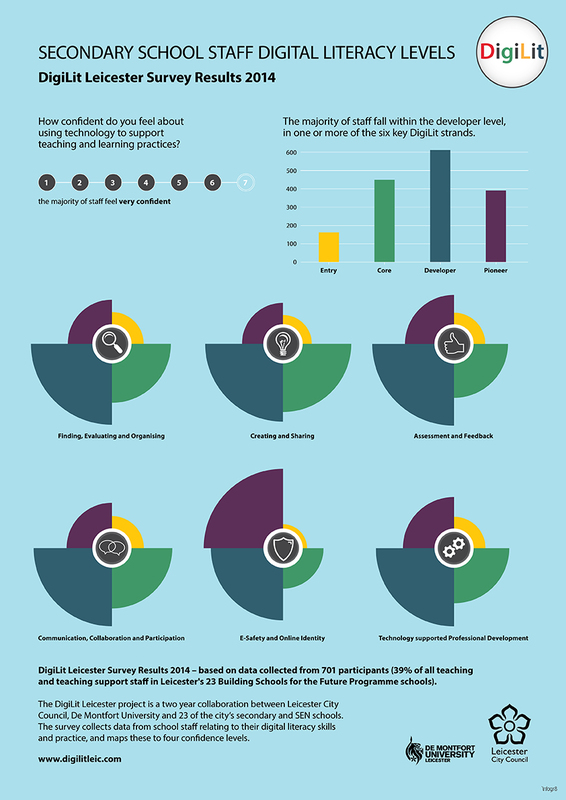 To celebrate the release of the 2014 Survey Results, the DigiLit Leicester team worked with Infogr8 in order to create a simple and easy to read visual representation of the 2014 Headline data.